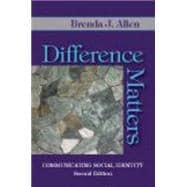 Allen's proven ability and flare for presenting complex and oftentimes sensitive topics in nonthreatening ways carry over in the latest edition of Difference Matters. Her down-to-earth analysis of six social identity categories reveals how communication establishes and enacts identity and power dynamics. She provides historical overviews to show how perceptions of gender, race, social, class, sexuality, ability and age have varied throughout time and place. Allen clearly explains pertinent theoretical perspectives and illustrates those and other discussions with real-life experiences (many of which are her own). She also offers practical guidance for how to communicate difference more humanely. While many examples are from organizational contexts, readers from a wide range of backgrounds can relate to them and appreciate their relevance. This eye-opening, vibrant text, suitable for use in a variety of disciplines, motivates readers to think about valuing difference as a positive, enriching feature of society. Interactive elements such as Spotlights on Media, I.D. Checks, Tool Kits, and "Reflection Matters" questions awaken interest, awareness, and creative insights for change.